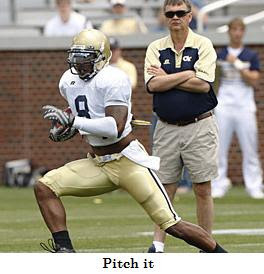 1.The Paul Johnson era at Georgia Tech started with a bang, as the flexbone ripped up the feared fighting Ryan Perrillouxs. (I'm actually at a loss for how to pluralize a proper name that ends in a silent "x" - the plural of "box" is "boxes," but the silent "x" throws me off. Oh well.) The question remains how the offense will do against the big bad BCS schools, though I'm of the belief that so long as the standard isn't that the offense must be #1 in the country and Georgia Tech must win multiple national titles in the next two years, then offense will most assuredly be judged a success. For those of you interested in a clear explanation of the offense I would be happy to provide it, except it's already been done by SMQ (now Dr. Saturday), with the help of a football coach. It's an excellent explanation of the flexbone, so get your technical football fix there. If you're still not satisfied, there's an entire Flexbone Association with a robust playbook section for those of you who need more diagrams to help you for the next time you play as Georgia Tech on NCAA football. One point on the offense. A lot of people don't really understand the whys of option football, and I think many of the spread teams now have further muddied the picture because they employ "reads" but don't really run "option football" in its pure form. The regnant feature of option football, and the feature that makes the scheme so effective and timeless, is this: Instead of asking your team to successfully make a series of one-on-one blocks to gain yardage, you simply do not block multiple defenders at the point of attack, instead optioning off of them to make them wrong every time, and your other linemen double team and crash down on the rest of the defense. So instead of trying to win one-on-one matchups you may or may not win, you do things your kids can do every time: double-team blocks and successful options. As I've said before, you don't win by only creating one-on-one matchups. You put the numbers to your own advantage. 3. I don't like to make predictions, but here's one: If Rich Rodriguez wants to have success this year (or in any future year) at Michigan, his passing offense will have to get more sophisticated. Now, this sounds like something Lee Corso might say, but hear me out. Many of the naysayers regarding Rodriguez's offense have based their opinion on no more than the last few seasons at West Virginia and Clemson. What they forget is that Rodriguez actually designed his offense back at Glenville State for the purpose of airing it out. He was a Run & Shoot guy, and his offense spread offense began as a simplified derivative of the 'shoot. So the naysayers overlook this history, particularly the stellar years he had at Tulane. Yet, as much as it pains me to say, the TV guys are actually sort of right. When Rodriguez got to Tulane with Tommy Bowden they threw the ball all over the place, but (a) it was in Conference USA, (b) they were excellent at the 3-step passing game, but defenses are better at defending against those passes now than they were a decade ago, and (c) his downfield passing game left something to be desired. And in the years since, it's not that Rodriguez is at heart a running guy, it's just that was what worked and it masked some of the passing game deficiencies. When I study the route combinations, they do not appear to be designed conceptually, and instead are a kind of grab-bag of a few routes here or there. You don't see his schemes organized of horizontal, vertical, and triangle stretches. Now, Rodriguez's saving grace is I've seen him in action, and he's an excellent fundamentals coach and is a great teacher. And I think he understands all these things - I mean the guy did exploit the zone-read spread stuff before anyone else - but hasn't had the chance to reexamine his offense with such a critical eye. This season, to be successful, I believe he will have to. Update - Feb. 17, 2009: The A-11 has now been ruled illegal. The ruling is consistent with this piece: rather than aim directly at the offense or the formation, the National Federation of High School Athletics has clarified the scrimmage kick exception to be limited only to fourth down. As explained in the full-post, the A-11's creators, Steve Humphries and Kurt Bryan, had found a way to transform the scrimmage kick exception (which all agree was at least originally intended only for kicking situations) into an every down offense by putting the quarterback more than seven yards deep. The new ruling eliminates this by requiring that at least four players on the line of scrimmage wear an ineligible jersey number (50-79), except on fourth down. The A-11's creators have a few arrows left in the quiver. First, they have encouraged teams interested in the A-11 to break off from their state's rulemaking body to form a loose-coalition of A-11 teams, or all A-11 league for themselves. Doing so would require that those schools would not be eligible for their state playoff systems (because they would not be following the rules/procedures that other schools did) and would have to encourage the other, non A-11 league teams locally to play them using their brand of rules. This proposal has not been met with enthusiasm, to say the least. The other proposal they have floated, this time via email, is called "numerical camouflage." To me, part of this is an admission that the A-11 itself is not that innovative -- the major contribution Bryan and Humphries made was not the formation or the "super-spread," but was with toying with who was and was not eligible so as to confuse the other team (and officials). Basically, they would line up in the A-11 or old BYU type formations with three interior linemen, and give the eligible and ineligible guys similar numbers, like "68" and "88." This way they could still have everyone huddle up near (but not on) the line of scrimmage before the snap, and then, just like the old A-11, have some of them step onto the line and be set for only a second. Whereas with the real A-11 each would be potentially eligible (before being covered up), here, although it would be foreordained that 68 would need to be on and 88 off, the defense might not be able to determine who was wearing 68 and 88 until it was too late. Make of that proposal what you will, but they are certainly determined. In any event, it's slightly sad to see it go. I never had any animosity against the offense (certainly not against innovation and being spread), but the scrimmage kick exception was never the proper vehicle. Maybe football is moving the direction the A-11's creators say to being fully wide-open where linemen are a thing of the past, but why not do away with the eligibility restrictions entirely? Many states also have 8-man football leagues, which more closely resemble Arena football, which is itself something like what the A-11 proponents advocated for. Moreover, there was always so much confusion about the offense: so many thought that "A-11" actually mean that the offense could send eight, nine, ten guys downfield to catch passes, when the reality was that it only referred to what was going on pre-snap, and after the snap the offense had no more downfield receivers than the west coast offense or the wishbone. Maybe in the future we will continue moving that way, but it always struck me as bizarre that this was seen as some kind of ultimate and brand new innovation. As documented in the full-post, the actual formations have been around for fifty years, and the Canadians have been one-upping the A-11 since they can send six receivers out for a pass (rather than five as with every U.S. team, including the A-11), due to the fact that there are twelve players on each side. If we want to change the rules we ought to do it head on. The memory of the A-11 will not fade away, and flag, Arena, and Canadian football are constant reminders of what is possible, if it is true that football is inexorably moving in the direction of being all-spread, all the time. I for one disagree that this is the only direction football goes. It is more cyclical than that and linemen are not as useless -- or as uninteresting -- as the A-11's proponents seemed to argue. Moreover, even in their vaunted offense, the players they replace them with are about as uselessly limited as a position can be: they stand on the outside of the formation and back up to possibly receive a lateral (which a lineman can currently do in any offense), but is otherwise purely a decoy. To me, the idea of the spread is to turn kids into threats by isolating them, moving them around, and unleashing them as downfield terrors. All too often, despite its "wide-open" appearance, the offense tends to restrict the number of eligible downfield receivers (because the running back is needed as a blocker with only three linemen, the offense routinely only can release four receivers downfield instead of five) and it turns players who can do multiple things to the defense -- yes, linemen -- into mere bystanders. That's not spreading; it's bad arithmetic. And that's not an argument against the spirit of the game or to persecute them, it's just that I don't think you gain a strategic advantage from the offense besides whatever deception you might get from confusing the other team about who is and is not eligible. Others are not so impressed. According to the Washington Post, Joe Warren, the football rules interpreter (what a title!) for Maryland’s Public Schools, has called the A-11 “sneaky” and declared that it “makes a travesty of the game.” A quick perusal of the lengthy threads on Coach Huey’s site reveals the deep discord surrounding this offense. And North Carolina has banned the offense, making a second offense grounds for suspending the coach. The debate is so vehement because the offense – and the behavior of its proponents – touches on many of football’s most timeless debates: the value of “gimmick offenses”; whether there is a type of “true football” and whether this offense violates it; the debate of whether something might be unsportsmanlike because though it is within the letter of the rules it is allegedly not within its spirit; and whether coaches are justified in marketing and selling their ideas for profit rather than sharing them freely. Explanation of the Offense and the Related Rules In both high school and college football, while a team is on offense it is required to have a minimum of five players wearing jerseys numbered 50-79 who line up on the line of scrimmage. These poor souls are branded “ineligible,” as in they are ineligible to receive a forward pass, regardless of where they actually line up. So you cannot throw number 63 the ball, even if he lined up in the backfield. Similarly, if 63 lines up at Flanker and 22 lines up as a covered guard, neither can go out for a forward pass, as 22 is barred under the traditional rule that only allows ends and backfield players to be eligible for forward passes. And unlike the NFL, High School and College ball does not have a reporting system to allow ineligible guys to become eligible again. This rule's animating rationale appears to have been an attempt to stamp out tackle eligible plays, possibly as a direct rebuke to Bear Bryant who in particular had used such plays with success. This is the base rule. The A-11 offense seeks to liberate those five from their “ineligible” status by relying on an exception to the general rule: the “scrimmage kick” rule. In both high school and college, if a team goes into a “scrimmage kick formation” (more on this in a bit) the offense can disregard the rule requiring the five-man minimum of 50-79 numbered players and can, if it likes, put eleven guys on the field who all have eligible numbers. (Still, only a total of six guys remain eligible to receive a forward pass: the two ends and the four backfield players. ) The scrimmage kick exception was put in sometime after the number-eligibility limitation to allow more flexibility on punt plays by allowing teams to put faster players on the field rather than having to keep five linemen on the field. So the A-11 offense is built on this scrimmage kick exception. To confuse the defense, the offense puts as many guys up near (but not on the line) as possible, and then shortly before the snap six of them (two ends and four interior linemen, not counting the center who is already on the ball) move onto the line, set for one second, and the ball is snapped and off the offense goes. The defense then must figure out who is eligible to receive a forward pass. The offense compounds this confusion by having the ineligible guys put their hands up, run bubble plays or little dummy hitch routes behind the line. They also can of course block for run plays or for screens, and they can even receive laterals (backwards passes), but a lineman wearing number 63 could already do that without the scrimmage kick formation. Note also, however, that once a player has lined up on the line of scrimmage he remains ineligible and you can’t then shift who is on and who is off multiple times. What is the scrimmage kick formation? I saved this for last because the formation is defined differently for college and high school. In high school, a team lines up in a “scrimmage kick formation” anytime they have a “receiver” of the snap lined up seven yards deep or more. (I say “a receiver” versus the receiver because it doesn’t have to be the actual recipient of the snap. For example, on a fake punt the punter lines up more than seven yards deep but the actual snap might go to the upback who is lined up only four yards deep.) So all a high school team needs to do is put its quarterback seven yards deep and then it may employ this scrimmage kick exception. This is how Piedmont turned the A-11 into an every down offense. In college football, however, the exception is more narrow: A formation will only be deemed a “scrimmage kick formation” (thus making the offense exempt from the 50-79 numbers requirement) if the above requirements are met and it is “obvious that a kick might be attempted.” In other words, if an offense lines up on first down with the quarterback seven yards deep but with no other indication of an impending kick – field goal or punt – then the scrimmage kick exception does not apply and the offense must still have five guys with ineligible numbers. Some states like Texas use college rules for high school football so the A-11 is functionally illegal there, as well. As a final note on the possible origins of the offense, the idea of detaching the line from the usual five interior linemen set has been well known at least since the 1980s and 1990s as BYU under LaVell Edwards and Steve Spurrier both used such sets with success. Of course, both used it only in spot duty as a change up as something to make the defense prepare for a little bit extra each week. Run and Shoot innovator Tiger Ellison also explored the idea decades earlier. But, as far as I am aware, Piedmont under Humphries and Bryan were the first to wed the general idea to the scrimmage kick formation to get eleven possibly eligible players onto the field. The reality of course is that while no one enjoys football’s strategic complexities more than I do, at core football is a simple game, and none of us are luminous visionaries. Although there no question that it was creative to combine the BYU formation mentioned above with the Scrimmage Kick exception to create some pre-snap confusion, this is not the stuff of “Genius,” (as ESPN.com would lead us to believe), it is not “futuristic football,” (whatever that is supposed to mean), and, not only is it not Innovative (certainly not in the capital letter sense), the self-righteous obsession with transcending mere coaching to become known as an “Innovator” is immaterial, misguided, and probably just plain unhealthy. One of the difficulties of discussing the offense is trying to separate the A-11's schemes from Steve Humphries (Piedmont’s director of football operations) and Kurt Bryan (Piedmont’s head coach), the offense's rather unique and vocal creators. A major reason why this offense so quickly left a bitter taste in these coach’s mouths is because it didn’t hit them the way normal football innovations do, which is by word of mouth about what some team is having success with: “Hey, have you seen what Podunk High/Eastern State U is doing? It’s really interesting! Check it out!” Instead, coaches were bombarded with the offense through some kind of directed marketing blitz more akin to laundry detergent than a football offense. To many, the “A-11 Offense” came across less like an offense to be marketed than as a marketing campaign looking for an offense. Keep in mind that the entire history of this offense has been roughly 7-9 games of partial then full use by a single small division high school team. Within a matter of months of losing in the playoffs, Bryan and Humphries launched a soft and direct marketing campaign – complete with media and internet write-ups, websites (a11offense.com), message board postings, by hosting and attending clinics – and now of after some success there is now (surprise!) a DVD set available for purchase, where one can learn to install this magnificent offense for the low-low price of $199.99 (or $40 for a given component). Even the origin of the moniker "A-11" is preposterous: it takes a certain kind of hubris to actually name your own offense after using it for less than a season, especially considering that even the vaunted “Airraid” offense used by Mike Leach, Chris Hatcher, and Hal Mumme had been in use for nearly a decade before some employee working in marketing in the University of Kentucky’s athletic department thought it’d be a good way to sell some tickets. But more power to them on this marketing blitz. If people want to buy these DVDs, that’s fine. What troubles me is their approach to football and their self-designation as Innovators and Idea men. Like much else in life, in football the conviction that everything you are doing is innovative (“every play is innovative”) indicates that either you are woefully ignorant of what you are doing (or else it wouldn’t seem so innovative) or you’re simply being arrogant and it's the arrogance blinding you. So maybe the A-11 is truly innovative, so long as our definition of what is innovative includes game-changing irregularities like, uh, spread punt formations that a variety of teams have used for decades. Of course, what Humphries is really looking at as his barometer of innovation was that University of Florida offense in the 2007 BCS Title game between Florida and Ohio State. He mentions it here and it is mentioned both in the Washington Post and ESPN.com write-ups of the offense (of which the Washington Post's article was far superior; I lack the adjectives to explain how laughably abysmal the ESPN.com piece is). ESPN.com earnestly tells us, apparently in some misguided effort to convince us of Humphries’s genius and authority on the issue of his offense’s status on the Innovation-scale that – aside from going to Cal-Berkeley (holy! ), Humphries (wait for it) diagrammed every single play from this Florida – Ohio St. game. Continuing with the absurdity: Apparently Humphries, in his profound quest to diagram Florida’s innovative gameplan, must have failed to diagram any of Ohio St.’s plays. Had he done so, he might have noticed that Ohio State, with Troy Smith at Quarterback, used the zone read along with many of the same sets and formations as Florida and Meyer (hello!). Keeping this thread SERIOUS about forthcoming Innovations, does anyone out there believe in something Truly groundbreaking they are working on? Bryan saved the punchline until sometime later, but of course, the big reveal was that the A-11 was (surprise!) precisely the kind of “Seriously Innovative Idea” he had in mind. The point is that while the A-11 is certainly intriguing, what appears to drive these people is their self-aggrandizing belief that the job of a football coach is to Innovate and operate in the Realm of Big and Important Ideas, so that as a result they might be called geniuses (as ESPN.com shamelessly implies). They believe they have taken the pop-ready idea of the “Spread” to its extreme and should be praised accordingly. Football is a simple game. There’s plenty of complexity, but if you’ve appointed yourself a genius and a revolutionary then you not only lack humility regarding this sport (not to mention your profession) but you’re just plain missing the boat. Everybody’s got schemes. Good coaches surely spend time on schemes, but anyone who has ever been around the game realizes that schemes are just one part of coaching, and I’d say that schemes usually aren’t the outcome determinative part. I don’t even think schemes were necessarily the difference in that famed 2007 BCS game between Florida and Ohio St. that Humphries is so fond of. And, most ironically, I think these even more egregiously miss the boat on what the importance of their own offense is in their frantic attempt to be recognized as revolutionaries and Innovators. Even with the A-11, a team is still constrained by ineligible players at the snap due to who is covered up even if it can play pre-snap games. They shouldn’t think of it as a super spread. Instead, Bryan and Humphries ought to view the philosophy behind their offense as a willingness to detach and play around with the idea that the five interior linemen don’t have to be seen as a unit of five interior linemen. The argument on the other side all-too-often goes as follows: the A-11 isn’t real or true football and therefore it is bad or illegal or sinister or poor form or the like. Yet, haven’t we heard this charge before? Yes we have: The spread isn’t real or true football and therefore it is bad. And the run and shoot isn’t real or true football and therefore it is bad. And the West Coast Offense isn’t real or true football and therefore it is bad. And the wishbone isn’t real or true football and therefore it is bad. Hell, at one time the argument was that the entire T formation with a quarterback behind the center wasn’t real or true football and therefore it was bad! I could stop here. But the A-11 raises this important question: Is there some pure, true, Platonic-ideal football? If not, then why? The answer is that there is not such a pure, true, ideal football because football is a game; all the rules – except ones designed around safety - are arbitrary. They might have in mind competitive balance, but this doesn’t make it “true” or “real” in any meaningful sense. What are the most fundamental, “true,” important, or essential rules in football that you can think of? For me, short of the shape of the ball used, my tops would probably be the 100-yard football field, the limit on both sides to eleven players on the field, and the limit on offenses to four downs to score or get a first down. Certainly, all would rank higher than the number of players who might possibly be eligible to receive a forward pass pre-snap, which logically must also rank lower than the number of actually eligible receivers. Despite their absurdity, Bryan and Humphries have the better of this particular strand of the argument. I will address in the next section a few thoughts on whether the Scrimmage Kick rule ought to be amended, but hopefully I have helped discredit the notion that football – or any other game – has some kind of “true,” inviolable Platonic-ideal form which makes violators of such true or ideal football both wrong and bad, and I hope I have shed some light on why the cult of Innovation is misguided. Should the Rules be changed to outlaw this offense? There are two lines of attack on the offense: First, it is already unsportsmanlike because, though it might be within the letter of the rules, it is not within its spirit, and, second, regardless of your answer to the first question the rules should be changed to outlaw it. 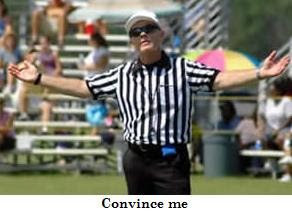 Following the discussion above, the rules governing football are simply the rules that govern a sport, and as a result are in fact arbitrary in nearly every case (again, 100 yard football fields, four downs, one foot or two feet in bounds, etc), so to say that something is invalid because it is not within a rule’s spirit even if it is within its text is an empty charge, at least in this narrow context. To say otherwise presupposes the view that Platonic-ideal football exists. The tougher question is the second: Should the rules be changed? The Scrimmage Kick formation was designed to enable teams to put faster players on the field when they punt. So one way to eliminate the offense would be to limit the use of the Scrimmage Kick rule to fourth down (though teams occasionally punt on third and long, depending on the situation), or to use the college rule which asks the official to only allow the formation if it is "obvious" that a kick could be attempted. But that isn't immediately fatal. In most states, a shotgun snap of seven or more yards triggers the rule that a defensive player may not immediately hit the snapper; the rule was similarly designed for punts and field goals to protect the long snapper who has to put his head down. But many passing teams have adopted this for their every down shotgun offenses to make their blocking easier and to provide their QB with more time. Coaches deride this as the exploitation of a loophole as well, though the rationale of protecting a snapping center from head blows still applies. But not every “loophole” must be closed. Yet, the flipside for Bryan and Humphries of rejecting the Platonic-ideal view of “true” football is that the ruling body, being merely the body charged with establishing the arbitrary rules of a game designed for amusement, are free to do whatever they like. Coach Bryan likes to say that one of the best aspects of the A-11 is that it is fun for the kids, and he’s right that football rules are designed to foster a game that is fun to play. But not everyone’s fun is the same, and many – in my view rightfully – don’t always see the swinging of the advantage to the offense as promoting fun. Arena football and “traditional” football (a more accurate term than “true football,” though not entirely accurate because the game has still changed in many, many ways) were not meant to be the same. As a result, even the taking of certain aesthetics into consideration is permissible. So the decision to close the loophole and eliminate the offense must be made much like we make other decisions in our democratic society in that these rule makers – many of different minds and opinions, after consulting the public – will not be able to theoretically deduce the best answer like Descartes or by appeal to Platonic-ideal football, but instead, like Montaigne (to stay with the philosopher theme), will have to bring their own best judgments to the question. My answer: The loophole ought to be closed. I don't think there is any hurry, and it is entirely fine that it is too late now to ban it for the Fall 2008 season because I sincerely doubt that it will catch on. While it will be excruciating to hear the A-11's Innovative creators claim martyrdom from now until the end of time, the fact is that the rule does effect a rather significant change on the game and, to say nothing of whether that change is a good or bad one, it's bizarre to effect it through an exemption designed for punts. Maybe the number eligibility rule itself should go (though if so I'd like to see the requirement that the offense be set increased to two seconds instead of one), but if it is why not abolish that rule directly instead of through this exception? To me, that - the oddity of making such a major change to football through a rule designed for punts - tips the scales in favor of banning it, rather than simply worrying about whether the defense might get confused. If Bryan and Humphries want to run their offense, they should take their results from last season and the upcoming one and lobby the rulemakers to abolish the number eligibility rule itself rather than continue with all this. I have a few issues with what the A-11 set forces you into. My biggest complaint is that, if you ignore the raw confusion you might cause a defense about who to cover, it’s not a particularly effective set for dropback passing. This is because, with only three interior linemen (and only two gaps) you are largely forced to use one of your two backfield players to block. So what happens is that, while you have six guys “spread out,” you actually can only get at most four of them out to catch a forward pass. This is particularly significant because (a) the defense can largely ignore the ineligible receivers (assuming they can identify them), thus making them entirely useless to you (you will have traded one receiver for zero defenders, a fatal trade when, as I’ve discussed before, you really want to trade one receiver for two defenders to open the others up), and (b) you’ve shortened the pass rushing edges by a great deal. I know the theory is that you can spread and release it quickly, but even spread teams recognize that shortening the edges decreases the time it takes for outside rushers to get to your quarterback. For the run game it’s hard to say because defenses haven’t yet had time to adjust so it’s guesswork to determine what fronts are expected, but generally the disadvantage of fewer linemen is that there are fewer gaps for the defense to control, and therefore it is harder to employ traps and double teams. For example, if a three-man defensive front team (i.e. a 3-4 defense or a 3-3-5 defense) lines up against a traditional set with two tight ends, there are six interior gaps to control and double teams are easier. If a three-man defensive front team lined up against the base A-11, they would have all three linemen covered and they have more defensive linemen than there are gaps. This is not fatal, but it is a concern. The theoretical advantage of the offense – aside from mere confusion on who can release for forward passes – is to further the spread offense’s quest to turn football into a counting game. Dan Mullen, Florida’s offensive coordinator under Urban Meyer, likes to say that as a general rule they will run the ball with their spread against five-man fronts and throw it against six-man fronts. The A-11 or an A-11 type offense can ratchet up some of these numbers with a healthy screen game. Really, if you’re going to spread out guys who are ultimately ineligible, they have to be a threat to block for screens. Then you could go to the line with a play like the double-screen play below where the QB reads the defensive end (if the DE rushes or stays home, throw it to R on the crack-screen; if he follows the R out throw the receiver screen) and has the option to check to an inside run like a draw or lead play. And one could also use simple quick passing plays with dummy routes by the covered guys. Again, I’m not a big fan of these dummy routes, but in spot duty they can be acceptable. Also, if I was going to do this I would heavily employ an H-back because he would be the type of quadruple threat – block, release for a pass (or check-release), take a hand-off, or block for a few counts and release for a delayed pass – that could really help the offense. I’d like to say that there was a whole lot more to it but there really isn’t. Unless you’re going to have your spread linemen run complex trapping schemes out beyond the hash marks it’s difficult to have truly complex pass patterns or blocking schemes in this offense. (A good high school will often use sprint out blocking from this set.) But of course if it works to make the game into a counting one then that is a virtue. Simple is better. How unique, this whole experience. I suppose it’s no surprise that the people who would try to turn the scrimmage kick formation into an offense (and possibly even into a Way of Life) would be like Humphries and Bryan – egomaniacs and desperate for wins. It’s a creative gesture, made all the more bold because they went right to it as an every down offense. And all the more audacious because the offense barely had gone from whiteboard to field before it became a DVD available for sale. But that’s the world, I suppose. I certainly have bought many football DVDs and materials. And Humphries and Bryan might just be acting realistically: I expect this comet to burn up before it lands. I don’t think defenses will forever remain bewildered by the offense – indeed, Piedmont lost its last two games last season 38-15 and 56-21 – and there isn’t really a debate about whether the scrimmage kick formation was intended for this purpose (it wasn’t). Maybe the 50-79 eligibility rule ought to be done away with, but I’d guess that the rule makers will want to do it directly through amendment than indirectly as with the A-11. Nevertheless, I’m quite curious – all any of us have seen are a few p and some grainy YouTube clips – and I’m sure Piedmont will be heavily followed this fall.